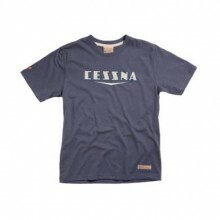 Our 100% "Ungeneric" Cotton T-shirts are specially made to our fit, colour and quality specifications. All shirts are washed after printing - eliminating shrinkage and adding vintage appeal. Some customers tell us they save our shirts for special occasions so they'll last a lifetime! We recommend acquiring spares! Click the button below to add the CESSNA CHEVRON T-SHIRT to your wish list.